Illustration of lung cancer cells during cell division. Lung cancer awareness month started hot on the heels of two exciting pieces of news that highlight the promise of immunotherapy as a treatment for non-small cell lung cancer (NSCLC), which accounts for 84 percent of the 224,210 new lung cancer cases that are projected to be diagnosed in the United States this year. The news surrounds two agents in the new class of cancer immunotherapeutics called PD-1 inhibitors, pembrolizumab (Keytruda) and nivolumab (approved in Japan as Opdivo). As I’ve previously discussed on this blog, these agents have already received regulatory approval for the treatment of certain patients with metastatic melanoma in the United States and Japan, respectively. Last week’s news provides more hope that they may help make significant inroads against NSCLC, a devastating disease with a five-year survival rate of just 18 percent. Last week, it was announced that the U.S. Food and Drug Administration (FDA) had granted pembrolizumab breakthrough therapy designation for the treatment of certain patients with NSCLC. This designation is intended to expedite regulatory assessment of the immunotherapeutic and it is only granted to agents that show substantial improvement over available treatments in early clinical trials. The FDA decision was based in large on data from an ongoing phase I clinical trial called KEYNOTE-001. The most recent data from the trial, presented at the European Society of Medical Oncology 2014 Congress in late September, show that about 20 percent of patients with advanced NSCLC had their tumors shrink or disappear after receiving pembrolizumab. Also last week, Bristol-Myers Squibb—the company developing nivolumab—announced that 41 percent of patients with advanced squamous cell NSCLC who received nivolumab through an ongoing phase II clinical trial called CheckMate 063 were alive at one year. Although all participants in the clinical trial received nivolumab, Bristol-Myers Squibb noted in its announcement that historical one-year survival rates for patients like those in the trial are between 5.5 percent and 18 percent. 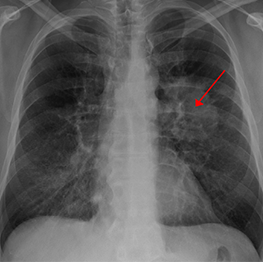 Lung cancer seen on a chest X-ray. Image by James Heilman, MD, at Wikimedia Commons. Licensed under CC BY-SA 3.0. The data, which were presented in full over the weekend at the 2014 Chicago Multidisciplinary Symposium on Thoracic Oncology, also show that 15 percent of the patients had their tumors shrink or disappear. Last week’s news provides positive updates on the development of PD-1 inhibitors for NSCLC. However, final results from these and other ongoing and soon-to-start clinical trials testing pembrolizumab and nivolumab as potential treatments for NSCLC will be needed before we know whether these agents will break through to become part of routine care for patients. Further studies are also needed to determine the optimal treatment for patients with NSCLC. In addition to the immunotherapeutics pembrolizumab and nivolumab, molecularly targeted therapies, such as those discussed by my colleague Srivani Ravoori, PhD, in her blog post, “New Findings Open Doors for Rational Lung Cancer Treatment Strategies,” are also benefiting subgroups of patients with NSCLC. Moreover, it seems that no treatment works for every patient with NSCLC, and nearly all patients ultimately relapse. As a result, more research into lung cancer is urgently needed. To assist with the need for continued research in this area, the American Association for Cancer Research (AACR) reminds investigators that letters of intent for the new Stand Up To Cancer-American Cancer Society Lung Cancer Translational Research Dream Team Grant are due by noon ET on Wednesday, Nov. 5. Can you direct me to the FDA approval page for this drug? I had heard the FDA was going to approve an immunotherapy drug for cancer in 2014. I guess this did not happen. Very disappointing. Sorry, specifically for lung cancer. While the FDA did not approve an immunotherapy drug for lung cancer in 2014, there are a number of phase III clinical trials currently ongoing that are testing immunotherapies as treatments for non-small cell lung cancer. It is hoped that the promising early results are confirmed in these trials.